VPN or Virtual Private Network has great use when it comes to accessing the Internet, especially when it’s not easily accessible. 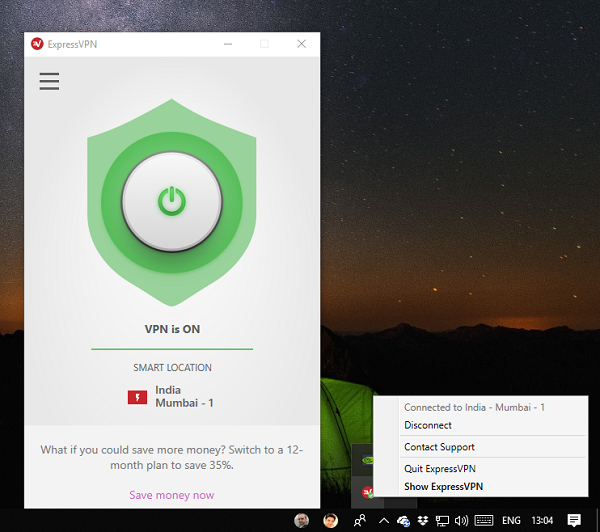 There are tons of VPN software available, but ExpressVPN is one which is impressive both in terms of features, and performance. The setup is very simple. Once you buy the subscription, you will be able to download a copy of the software. It works on Windows, MacOS, iPhone, iPad & Android. Post installation, you can use the activation code from your Express VPN account to activate the software. You might have to restart your computer. When everything is complete, you just need to turn on the big toggle button on the software to start using the VPN. The internet will not work for a moment while settings are changed, and then it will be back with VPN enabled. Now, let’s take a look at all the features ExpressVPN offers. This service is available on almost all the platforms which means you can access your content from any device. Contents which are geo-restricted or locked only for a particular region can also be accessed by changing the location of the VPN servers. ExpressVPN offers 148 server locations in 94 countries all over the world which makes it versatile. You can watch, listen, stream any sort of content which is censored and blocked websites around the world, even while traveling. Every server has their own speed, and the software lets you choose the fastest VPN server location for your network. It offers built-in Speed Test feature which helps you get analysis. 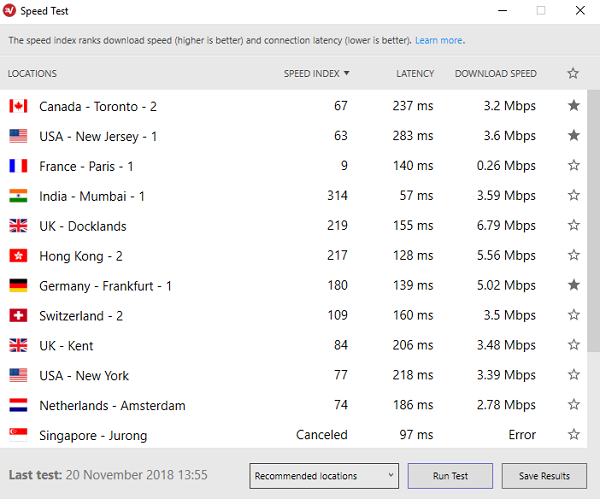 To choose the best network, you will have to run the speed test before turning on the VPN. The speed test displays speed index, latency, and download speed of each server. You can mark the best among it as a favorite which will make it easy for you to change when required. You can switch between recommended, all and recent to find your favorite server. It is possible that you may want to use VPN only for a few things, and the rest of them should go through your regular internet. Privacy, Security and there could be many other reasons for that. ExpressVPN offers per app basis VPN or what is popularly termed as VPN split tunneling. To use this, go to Options of the app > check on “Manage connection on a per-app basis”. Then click on Settings and select the app by clicking on the plug icon. You can choose to add apps that work with VPN, or you can choose to restrict apps which don’t work with the VPN. If needed you can switch network protocols between UDP, TCP, SSTP, L2TP, PPTP depending on your requirement. It is also possible to Prevent IPv6 address detection while connected. ExpressVPN has a dedicated page which lets you watch your favorite sports. It includes NFL Live, Champions League Live, English Football Live and so on. You can also watch Football, Tennis, or Boxing. You will need to connect to a server where streaming is not blocked. The software offers a kill switch by automatically stopping all traffic from entering or leaving your device to make sure internet privacy. This prevents your network traffic from being routed back through your internet service provider and exposed to prying eyes. The software also makes sure that network is optimized to maximize VPN Speed. It does so by setting Receive Window Auto-Tuning Level to ‘normal’, and disabling Heuristics. There are many VPN which offers ways to access geo-restricted content, but not every service keeps things secure. Any VPN should make sure that the data sent over their servers are secure. Express VPN offers protection with advanced mathematics in AES-256. This encryption standard is trusted by security experts worldwide. No activity and connection logs: Since all the data go through servers many would believe getting tracked. This service makes sure that no traffic data, DNS queries or anything else is tracked to identify users. 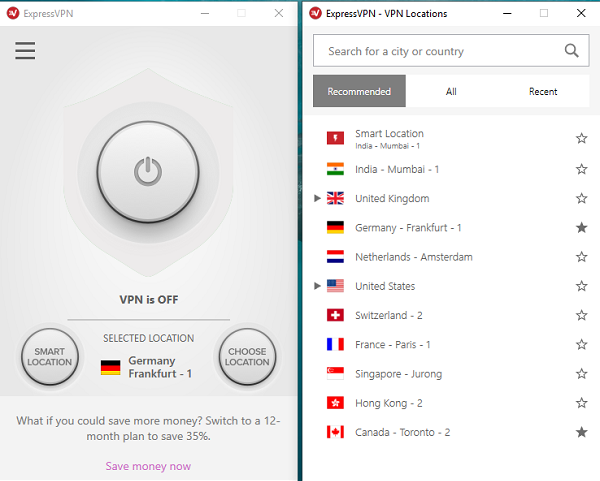 You can hide your true IP by changing your IP address through one of the ExpressVPN’s secure VPN servers. Most of the users want to stay anonymous when browsing online. You can pay with Bitcoin and use Tor to browse ExpressVPN’s hidden .onion site. You can choose the best VPN protocol for your network, or let the software automatically choose it for you. ExpressVPN runs its own in-house private, encrypted DNS on every server, making your connections both safer and faster. Apart from all these, Express VPN offers a guide on Internet Privacy, how to browse anonymously, and stream sports. Anonymized analytics data such as speed test data, connection failures, and crash reports. ExpressVPN is a paid service without any free trial, but it does come with a 30-day money-back guarantee. There is no limitation put during these 30 days, and you get to use all the features. You can use it on three devices simultaneously which means you can share it with your friends or even family members which reduces the overall cost. 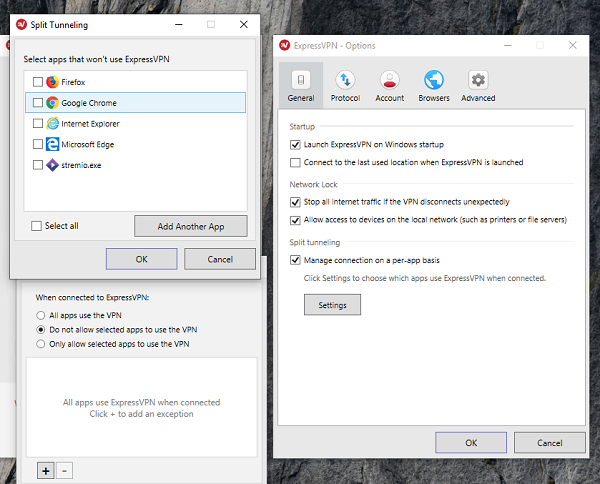 ExpressVPN also supports Chrome, Safari, and Firefox. It costs $12.29/Mo which is decent to get started with it, and then you can switch to $9.99/Mo if you opt-in for 6 months plan, and lastly you have $8.32/Mo if you take a full year plan. A paid service with the real human support that 24/7 makes sense. ExpressVPN offers that to help you set up, and troubleshoot. It is currently offering some fantastic Black Friday and Cyber Monday SUPER DEALS! I’ve used it — good service. Very good service, I’m happy.